Today Jupiter has turned retrograde, which inverts the energy, turning it inward. It's as if the light has gone deeper underground, the power less clear, the safe havens less accessible. 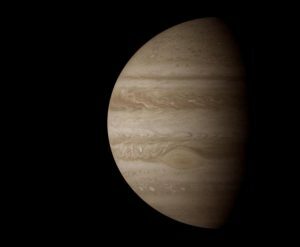 But the wisdom of Jupiter retrograde is in the discovery of faith and truth within oneself rather than pinning it on outer institutions like religion, government, celebrities, political movements. Our search for truth and higher meaning begins within, for if we cannot find our own light in our own dark we remain a slave to outer powers and inner cravings. We therefore must learn what it means to be our own shamans, for ourselves and each other. To do this, we might take a walk alone in nature, contemplating how we can cultivate a recognition of higher purpose for our life's challenges through greater inner faith. Or we might seek out ways to integrate our darker and more mysterious qualities through therapy or sacred ritual. We might also finally disengage from toxic powers that we can no longer tolerate, such as abusive environments, relationships, work, eating habits, addictions. Even then we have to keep digging, despite the allure of our ego's convictions. Jupiter in Scorpio wants us to keep on questioning, to penetrate deeper and deeper, never ending, into the well of truth. Whatever is up for you, remember that you are the guru of your life, that the power of wisdom and intuitive truth is real and alive in you, you just have to get quiet and listen. To quote John Sacelli, "The hidden meaning of Guru is in its spelling - Gee-yoU-aRe-yoU." For now the wisdom that we need is found in the dark depths of our emotions, desires, sexuality, psychological woundings and earned healing. To "romance the shadow," as Connie Zweig puts it, is to dance with our dark self and hear the whispers from deep within, but without losing ourselves to our dark impulses. Merging the light of awareness with the dark of deep emotion — both agonizing and ecstatic — will bring forth solutions we have long sought. Very thought-provoking article. Jupiter in Scorpio, both retrograde and direct, is also a prime time to benefit powerfully from depth psychology excavations and healing therapies. Hopefully, too, the confluence of “Big Power” Scorpio (government, lobbyists) and justice-oriented Jupiter will bring substantial legislative reform to America’s gun laws. Praying for all victims of violence. Agreed about depth psychology, especially if Jupiter is transiting your personal 4th, 6th, 8th or 12th house. As for big power confluences – Trump and Kim Jong Un? Interesting times. May Jupiter indeed bring healing to deep places. Thanks for commenting.